Under one roof for the first time, the multimedia and art programs now offer undergraduates gallery space for their own work, the latest equipment and plenty of natural light. 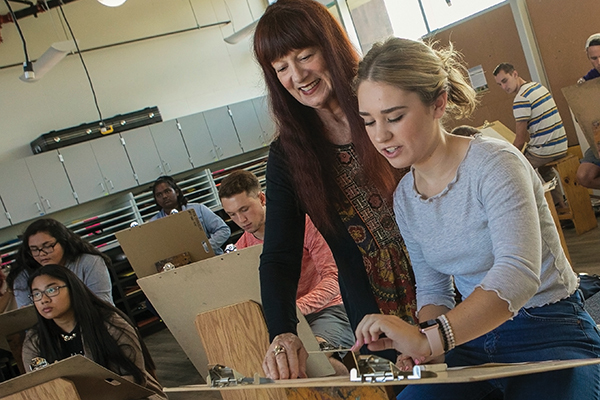 Visual arts students at Cal Lutheran have never seen anything like the $8 million, two-story, 20,000-square-foot William Rolland Art Center located west of the stadium along Olsen Road. Each of the art center’s interior spaces has its own character and vibe, with views of the riparian corridor and the rocks on Mount Clef Ridge brightening the studios on the back half. Builders and project managers considered the acoustics of every room. As one result, the art center has 48 distinct wall types, according to capital projects assistant Christine Cano. Power tools in the sculpture studio are muffled by 14-inch double-stud walls with a cavity. Throughout much of the building, plywood panels finish walls rather than drywall, so that you need not locate studs to hang displays. While art draws attention left and right, eyes do wander to high ceilings that have their beams, insulation, wiring and other structural innards exposed, for a touch of postmodern swank. A few visitors have asked when those ceilings will be finished, Cano said. Larkin Higgins, a professor of art who started in 1985, loves one airy top-floor drawing studio that reminds her of “a chic industrial-inspired café setting with the overhang, like an amazing open café that greets me in the morning.” She points out independent switches for lights, window coverings and climate: “You have no idea. It’s heaven.” For 30 years, Higgins didn’t have an office window. Now, with the art center in place, alumni will have to tell us how we went so long without it. According to an official Cal Lutheran history published in 1984, the first studio art classes were held “in the remodeled Pederson garage adjacent to the ranch house.” For most of the university’s history, the art facilities were kept in former chicken coops and a long metal-roofed building. Until this fall, working with a gas-fired kiln at Cal Lutheran meant making guesses about its operation based on sight and sound, according to Janet Neuwalder, the adjunct faculty member who teaches ceramics. A few years ago, she helped to acquire two modern electric kilns that will continue to get plenty of use. And now, with the purchase of a propane-fired model from Huntington Beach–based Geil Kilns, students have a range of options for developing the colors of their glazes in oxygen- and carbon-rich air. Ceramics students share working space with printmaking, and the art center has studios for drawing, painting, photography, sculpture and watercolor/design. Art history classes, among others, meet in a lecture room with seating and equipment suitable for film screenings and with walls to isolate the noise. William Rolland of Malibu, whose donations made the athletic stadium and adjoining art gallery possible six years ago, gave $4 million for the art center.